Worker exploitation and workplace health and safety are as much of a concern to school work experience students as they are to paid employees. Endeavour College pathways leader Annie Fitridge believes work experience students often lack the confidence to speak up about unfair or unsafe work practices and need to be taught that “if it doesn’t feel right, it probably isn’t”. “It Can be very challenging for a young 15-year-old to go to their (work experience) boss or supervisor to say, ‘I don’t feel comfortable doing that’,” Fitridge says. While Endeavour has had very few work experience incidents, Fitridge says statistics showing workplace exploitation and injuries are more common among young people make it likely that school work experience students are at risk too. She says the college provides general teaching on workplace health and safety but students are also counselled on their individual work experience placements to avoid potential hazards. Grace Atta, 15, undertook work experience at children’s allied health provider Family Time Australia. She says the support provided by her school made her less anxious in the lead-up to her placement. “Telling us that it’s OK to say ‘No, I don’t want to do that,’ is something (students) need to hear because it can be scary to say no to an employer when you’re wanting to have a good impression of you.” she says. 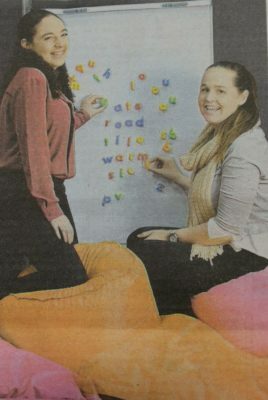 Image: (Endeavour College) Student Grace Atta, who did work experince at the occupational therapy practice, with speech pathologist Chanelle Fimer. Picture TOM HUNTLEY. Original Source: The Advertiser Careers Lift out, Saturday, August 26, 2017, p.14.